Here's how to improve the battery life for your Galaxy Tab 2 (7.0). To make your Galaxy Tab 2 (7.0) visible to Bluetooth devices, view this info. Learn how to pair your Samsung Galaxy Tab 2 (7.0) with your Bluetooth device. Learn how to turn on and off Bluetooth functionality on your Samsung Galaxy Tab 2 (7.0). Here's info on common camera settings (e.g., flash, timer, front / rear camera, etc.) for your Galaxy Tab 2 (7.0). Learn how to adjust the video size for easy sending in emails on your Samsung Galaxy Tab 2 (7.0). A visual guide for changing camera shooting modes to things like landscape or night on your Samsung Galaxy Tab 2 (7.0). A visual guide for changing the picture size and quality on your Samsung Galaxy Tab 2 (7.0). Discover how to change the camera from rear to front-facing for video recording on your Samsung Galaxy Tab 2 (7.0). An interactive guide on how to change the camera from rear to front-facing for taking pictures on your Samsung Galaxy Tab 2 (7.0). A visual guide for deleting a picture from your Samsung Galaxy Tab 2 (7.0). A visual guide to deleting a video on your Samsung Galaxy Tab 2 (7.0). Learn how to record a video using your Samsung Galaxy Tab 2 (7.0). Learn how to resize a picture on your Samsung Galaxy Tab 2 (7.0). An interactive guide on saving an edited picture on your Samsung Galaxy Tab 2 (7.0). Learn how to share pictures using your Samsung Galaxy Tab 2 (7.0). A visual guide to sharing a video on your Samsung Galaxy Tab 2 (7.0). A visual guide for tagging a picture to a location on your Samsung Galaxy Tab 2 (7.0). Learn how to take a picture using your Samsung Galaxy Tab 2 (7.0). A visual guide to using Pop Up Video for view videos while doing other things on your Samsung Galaxy Tab 2 (7.0). A visual guide for using Share Shot to quickly and easily share photos using your Samsung Galaxy Tab 2 (7.0). If you can't transfer media between your Galaxy Tab 2 (7.0) and PC, view this info. Here's how to add a Caller ID image to your Galaxy Tab 2 (7.0). Learn how to add a contact to your Samsung Galaxy Tab 2 (7.0). Learn how to add contacts to a group on your Samsung Galaxy Tab 2 (7.0). Discover how to add a picture to an existing contact on your Samsung Galaxy Tab 2 (7.0). Learn how to create a group on your Samsung Galaxy Tab 2 (7.0). To turn the mobile data for your Galaxy Tab 2 (7.0) on or off, follow these steps. Here's how to restrict the amount of data an app uses on your Galaxy Tab 2 (7.0). If your Galaxy Tab 2 (7.0) shows the incorrect date and/or time, view this info to correct it. If the display on your Galaxy Tab 2 (7.0) doesn't rotate, this shows how to fix it. A visual guide for saving energy on your Samsung Galaxy Tab 2 (7.0) by adjusting the screen timeout. An interactive guide for changing the language settings on your Samsung Galaxy Tab 2 (7.0). Removing then re-adding a Gmail account on your Galaxy Tab 2 (7.0) often fixes email issues. To update the personal email password/server settings for your Galaxy Tab 2 (7.0), view this. Here's info on updating work email settings for your Galaxy Tab 2 (7.0). Removing then re-adding a work email account on your Galaxy Tab 2 (7.0) often fixes email issues. Here's how to add a work email account on your Galaxy Tab 2 (7.0). Here's info on personal email settings (e.g., account name, etc.) for your Samsung Galaxy Tab 2 (7.0). To modify data usage options for the personal email account on your Galaxy Tab 2 (7.0), view this info. If you're not getting notifications for the personal email on your Galaxy Tab 2 (7.0), view this info. To enter or edit the personal email signature on your Galaxy Tab 2 (7.0), view this info. To adjust the personal email sync frequency settings on your Galaxy Tab 2 (7.0), view this info. Removing then re-adding an email account on your Galaxy Tab 2 (7.0) often fixes email issues. Learn how to forward an email on your Samsung Galaxy Tab 2 (7.0). Learn how to add an attachment, like a document or photo, to an email with your Samsung Galaxy Tab 2 (7.0). A visual guide for replying to an email on your Samsung Galaxy Tab 2 (7.0). A step-by-step visual guide for sending an email using your Samsung Galaxy Tab 2 (7.0). Learn how to set up a corporate email account on your Samsung Galaxy Tab 2 (7.0). Discover how to set up a personal email account on your Samsung Galaxy Tab 2 (7.0). Learn how to use multiple email accounts on your Samsung Galaxy Tab 2 (7.0). Here's how to view email messages on your Galaxy Tab 2 (7.0). Here's how to create a new Google account on your Samsung Galaxy Tab 2 (7.0). To add another home screen/panel to your Samsung Galaxy Tab 2 for more apps/games, view this info. If you're having other issues with your phone or device, visit our Troubleshooting Assistant. These walk you through solutions for issues you may have with your device. To change the Mobile Hotspot password on your Galaxy Tab 2 (7.0), view this info. An interactive guide for managing who uses your Mobile Hotspot on your Samsung Galaxy Tab 2 (7.0). An interactive guide for changing the Mobile Hotspot security settings on your Samsung Galaxy Tab 2 (7.0). Learn how to use Mobile Hotspot on your Samsung Galaxy Tab 2 (7.0). To turn Mobile Hotspot on/off on your Galaxy Tab 2 (7.0) or if you can't connect to Wi-Fi, see this. If you're having trouble connecting to the Internet or a web page won't display on your device follow these steps. If you're having other issues with your phone or device, visit our Troubleshooting Assistant. These walk you through solutions for issues you may have with your device. If you can't browse the Internet or view website images on your device, view this info. If you're having other issues with your phone or device, visit our Troubleshooting Assistant. These walk you through solutions for issues you may have with your device. Learn how to bookmark a website on your Samsung Galaxy Tab 2 (7.0). Discover how to navigate to a website on your Samsung Galaxy Tab 2 (7.0). Learn how to search the web from the Home screen on your Samsung Galaxy Tab 2 (7.0). Discover how to switch between windows in the web browser of your Samsung Galaxy Tab 2 (7.0). To unlock the screen on your Galaxy Tab 2 (7.0), check out this info. To disable the screen lock setting on your Tab 2 (7.0), check out this info. Learn how to lock and unlock your Samsung Galaxy Tab 2 (7.0). View this info on memory card formatting options for your Galaxy Tab 2 (7.0). Discover how to access and clear the Notification Panel of your Samsung Galaxy Tab 2 (7.0). An interactive guide on how to access and close open apps on your Samsung Galaxy Tab 2 (7.0). An interactive guide on how to add widgets and apps to the Home screen of your Samsung Galaxy Tab 2 (7.0). Discover how to add a Home screen on your Samsung Galaxy Tab 2 (7.0). Discover the features of the Notification Panel on your Samsung Galaxy Tab 2 (7.0). An interactive map of the most important features of your Samsung Galaxy Tab 2 (7.0). An interactive guide on how to move widgets and apps on the Home screen of your Samsung Galaxy Tab 2 (7.0). A visual guide for scrolling between multiple Home screens on your Samsung Galaxy Tab 2 (7.0). An interactive guide on how to remove widgets and apps from the Home screen of your Samsung Galaxy Tab 2 (7.0). Learn how to delete a Home screen on your Samsung Galaxy Tab 2 (7.0). Discover how to resize widgets on your Samsung Galaxy Tab 2 (7.0). Learn how to your Samsung Galaxy Tab 2 (7.0) on and off. If your Galaxy Tab 2 (7.0) has a blank or frozen screen or calling, app, audio and syncing issues, view this. 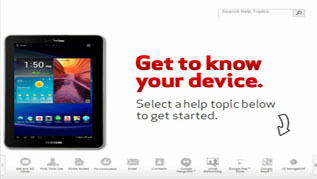 To check for or to install software updates on your Galaxy Tab 2 (7.0), view this info. To view the software version your Galaxy Tab 2 (7.0) is running, check out this info. Discover how to insert a micro SIM card into your Samsung Galaxy Tab 2 (7.0). Learn how to remove a micro SIM card from your Samsung Galaxy Tab 2 (7.0). A visual guide on how to browse Media Hub for movies and TV shows to watch on your Samsung Galaxy Tab 2 (7.0). Discover how to set up Media Hub on your Samsung Galaxy Tab 2 (7.0). Learn how to capture and view a picture of the screen on your Samsung Galaxy Tab 2 (7.0). Discover how to create a new document in Polaris Office on your Samsung Galaxy Tab 2 (7.0). An interactive guide on how to edit a document using Polaris Office on your Samsung Galaxy Tab 2 (7.0). Find more help from videos and tutorials on your Samsung Galaxy Tab 2 (7.0). An interactive guide on how to launch S Suggest on your Samsung Galaxy Tab 2 (7.0). Learn how to search for new apps using S Suggest on your Samsung Galaxy Tab 2 (7.0). Learn how to send media such as pictures, music, videos and documents using Samsung Link on your Samsung Galaxy Tab 2 (7.0). An interactive guide on how to send a document using Polaris® Office on your Samsung Galaxy Tab 2 (7.0). Learn how to set up Peel for controlling your TV and finding new TV shows with your Samsung Galaxy Tab 2 (7.0). A visual guide on how to share an app in S Suggest on your Samsung Galaxy Tab 2 (7.0). Learn how to use voice actions on your Samsung Galaxy Tab 2 (7.0). Discover how to change the background of the Home screen on your Samsung Galaxy Tab 2 (7.0). A visual guide for setting a picture as the background on the Home screen of your Samsung Galaxy Tab 2 (7.0). To remove a saved Wi-Fi network from your Galaxy Tab 2 (7.0), view this info. View this info if the Wi-Fi network you want to add to your Galaxy Tab 2 (7.0) doesn't display. Learn how to use your Samsung Galaxy Tab 2 (7.0) to connect to a Wi-Fi network. Learn how to turn off Wi-Fi notification so you no longer receive an alert when entering a Wi-Fi network on your Samsung Galaxy Tab 2 (7.0). Here's how to view signal strength on the Galaxy Tab 2 (7.0).